I had been to Brookside Golf Club once before. I can remember it well, because it was one of the most miserable golf experiences of my life. A friend and I went out there in the dead of summer to play the #1 course (now named after C.W. Koiner, whoever that is). It was a stifling hot day in Pasadena, as most summer days are. Because we were both cheap and ambitious, we decided to walk and carry our bags. It was a really long round at well over five hours. There were no benches on the course and not much respite from the heat as we waited long stretches in between shots. It was a brutal day, indeed. 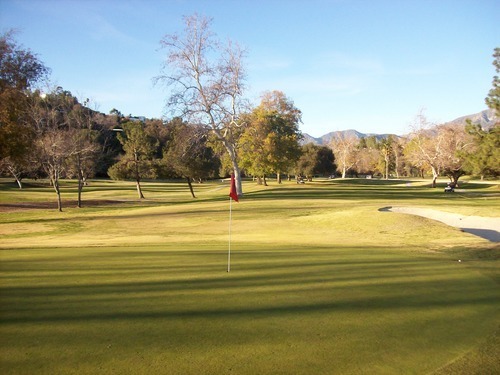 Since then, I’ve never been in any big rush to return to Brookside to play the #2 course (aka, the E.O. Nay Course). Now, I didn’t have any real problems with the #1 course itself. 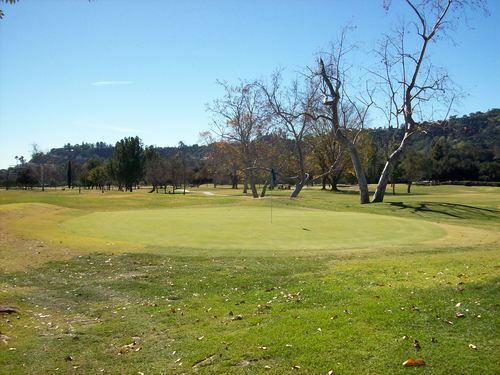 It’s a fine design, but both of these courses get so many players (especially on weekends), a Saturday at Brookside (like almost all LA County muni courses) is not my ideal choice. Nonetheless, I gave it another shot. I wanted to play yesterday, but I had no intentions of playing more than one round. Therefore, I wanted something inexpensive (ideally under $40). I wanted something relatively close to home (as in less than an hour away). And with the cold weather we’ve been having, I really didn’t want to do a “dawn patrol” round. Something mid-to-late morning would be best. Oh, and of course, I wanted to play a course I hadn’t played before! That didn’t leave many options, and as I scoured the internet in search of a good tee time for Saturday, the choices were few and far between. On Friday, I stumbled upon an 11:32 tee time for a single at Brookside on the #2 course (the one I hadn’t played previously). The price was only $30 (plus 99-cent booking fee). Their normal weekend rate with a cart is $60, so I figured it was about as good a deal as I’d get here and I booked it. 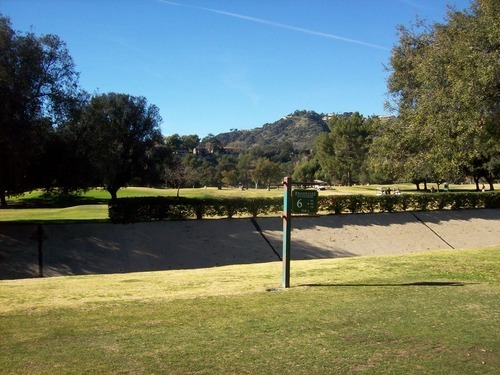 Now, the one neat thing about Brookside is the fact that the courses sit right next to the legendary Rose Bowl stadium. The #1 course has a few holes that run right alongside it, which I have to admit is kind of cool. Living in the shadow of that stadium does add a little mystique to Brookside Golf Club, which has been around itself since the 1920s, so I can appreciate the history and tradition there. I went in expecting a long and slow round, but it was a gorgeous day in Pasadena (nice moderate temperatures in the mid 70s this time), so I figured I’d still enjoy the day pretty well. After all, there are a lot worse things I could be doing on such a beautiful day! When I got there, though, the place was an absolute zoo. It was crowded, chaotic and clear that I was in for more than I bargained for. I checked in with the starter and they let me know they were about 20 minutes behind, but from the amount of golf carts lined up on the first holes of both courses, I had a feeling it would be much worse than that. I waited around, grabbed a cheeseburger at the grill and practiced putting for awhile. Luckily, most of the crowd seemed to be going off on the #1 course, so I think it was much further behind schedule than #2. Still, our group ended up teeing off just after noon, about a half hour late. The front nine was excruciatingly slow as there were foursomes and fivesomes stacked on the course as far as the eye could see. There was even a sixsome behind us, yet they were keeping pace because it was impossible not to. Everyone was waiting on every shot. It was just one of those days. We finished at about 5:20 (barely before it was too dark). The pace was actually quicker than it felt, so by the end I was actually just relieved that we finished all 18 in time. 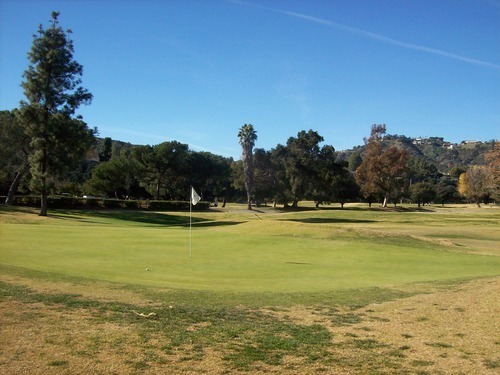 It’s fitting they use parts of Brookside as auxiliary parking during big Rose Bowl events, because “parking lot” is a term that comes to mind when thinking about the pace of play out here! The #2 course itself is just “okay” in my opinion. Nothing too special. It plays a little shorter and easier than #1, but still offers enough challenge to keep things interesting. 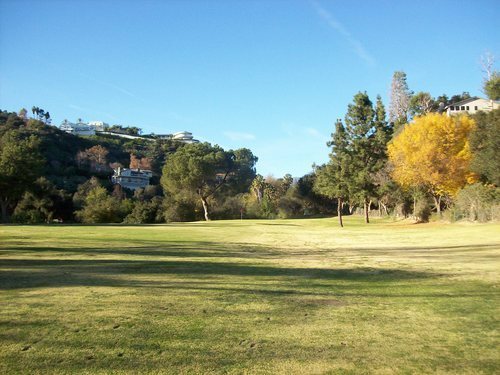 Trees line all the fairways. Some holes play rather tight and others are a bit more open. 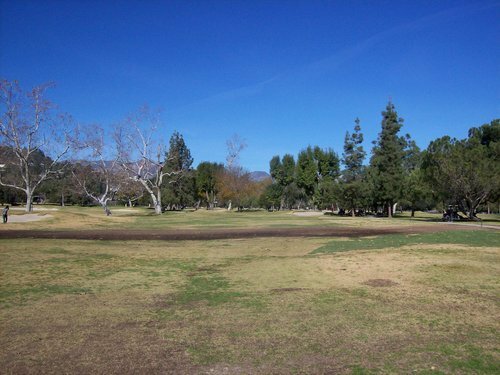 There are no real water hazards on the course, but there is a big cement ditch that runs through the course and comes into play on a number of holes. 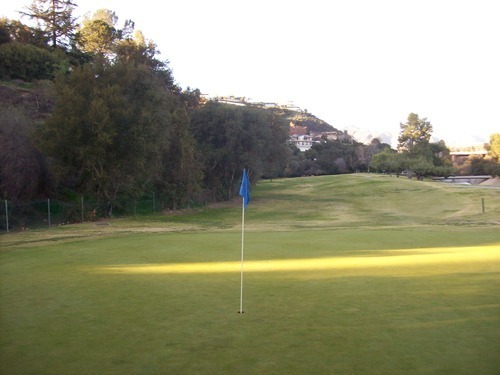 Where #2 does have the most bite is on and around the greens. The greens here are quite small and generally pretty well protected with false edges and bunkers with big lips. It’s definitely hard to get at some of these pins. Much of the back nine runs throughout a little canyon area that’s kind of a cool setting. There are some really nice houses up on the hillsides. There are hiking/biking/jogging trails and paths all around the edges of the course, which is kind of distracting at times. There is no shortage of healthy, attractive women going by (or men, too, if that’s your thing). 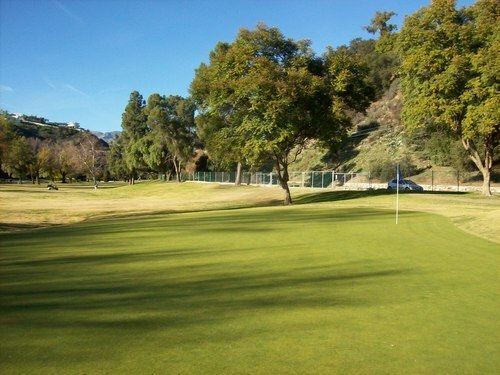 My point is that Brookside #2 could be a pretty course, but it wasn’t yesterday. When it comes to conditioning, I’ll usually cut courses a little more slack during winter months. 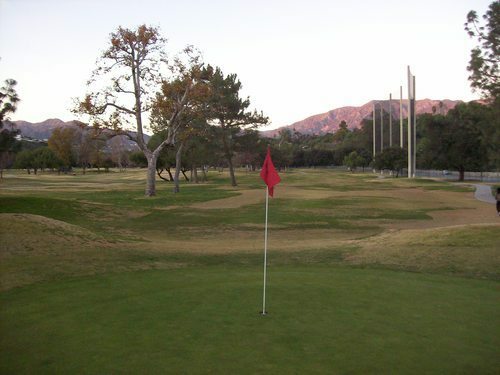 However, this course was one of the roughest I’ve ever played. The conditions were pretty terrible from tee to green. There were a few patches of green grass here and there, but mostly it was a wasteland. It was patchy everywhere. It was dead in most places. Other areas were just completely bare dirt and/or sand. It looked awful and didn’t play well because every lie was different and most of them were not good at all. I will say the bunkers had pretty good sand and that the greens were in fairly nice shape. With the delay in starting, I had a lot of time to practice putting, but it backfired on me. The practice green was slow and soft. 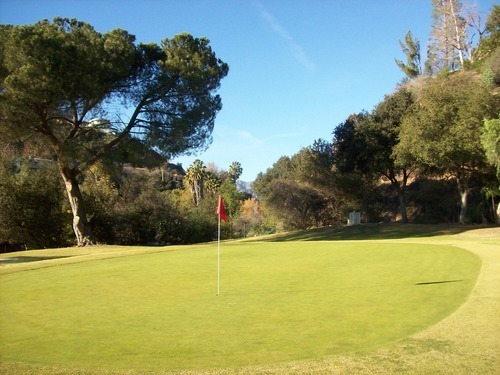 The real greens (at least on course #2) were firm, fast and very hard to hold, so it took me awhile to readjust. However, the greens were definitely better taken care of than the rest of the course this winter. I’m very glad I only paid $30. If I had paid a full rate, I would have been really agitated. No matter how bad the conditions, how slow the pace and how disorganized the staff, people are going to come out to Brookside in droves. 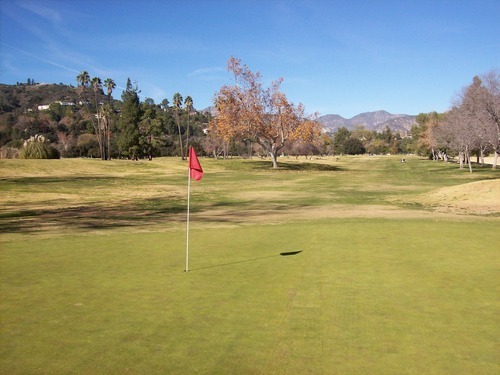 This is true on all LA County courses, but some definitely seem to try much harder than others. 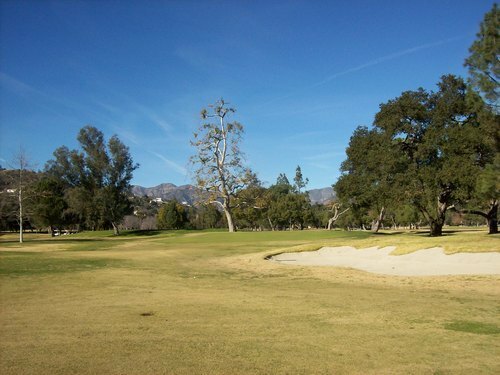 I’d love to see Brookside running at higher standards because these should be two really enjoyable courses in that neat little part of Pasadena where the Rose Bowl sits.